Joe and Joanne Garcia are a Santo Domingo Pueblo couple who work together to create handmade necklaces, mostly using turquoise. Like many traditional couples who work together at Santo Domingo, Joe makes the beads and Joanne strings the necklaces. We were so pleased to see Joe and Joanne make these again; we haven't seen them make these necklaces since 2011. These are hand-hewn graduated spheres of stabilized Kingman turquoise with rich, contrasting matrix throughout the stone. Handmade from rough rock, these "gumballs" of turquoise are shaped with a grinder, then tumbled to a polished finish in a rock tumbler. Finally, they are drilled for stringing. They are strung in combination with handmade disk beads of well-matched turquoise. The length of the run of 23 graduated Kingman turquoise gumballs is a bit over 16 inches, then the necklace terminates on each side in 4 3/4" runs of hand-turned disk beads which terminate in Sterling beads nestled into Sterling cones at the catch. 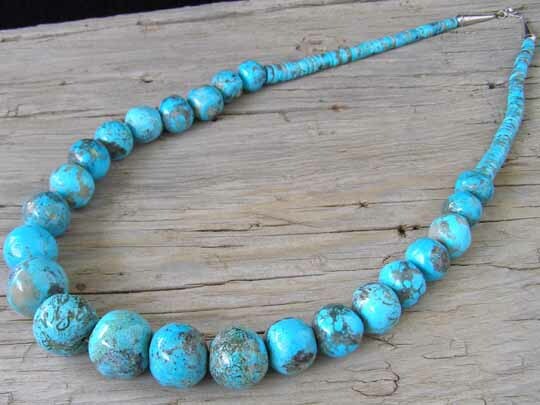 This is really stunning turquoise in a wholly handmade necklace.